[LENOX, MA] – Dorothy Thompson was the first journalist expelled from Germany on a direct order by Adolf Hitler and in 1939 Time magazine called her the most influential woman in America after Eleanor Roosevelt. In Cassandra Speaks at Shakespeare & Company, Tod Randolph delivers a complex, compelling portrait of Thompson in the world premiere production of this well-written, one-woman show. And then we discover that she is just an hour away from her wedding – her third. ‘I’m about to make a horrible mistake,” she says, quite seriously. 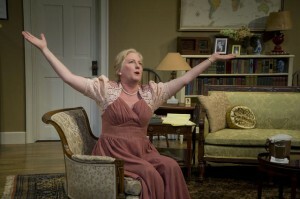 Randolph is marvelous in the role: she is authentic, engaging, wry, amusing, a little bawdy, and brilliant. 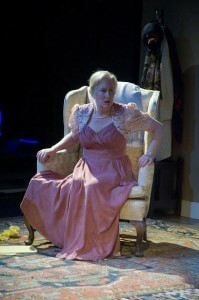 The production, skillfully directed by Nicole Ricciardi, is beautifully paced and balanced. One of the charms of this play, and of Randolph’s masterful performance, is that we see Thompson as the consummate professional, passionate and committed, and then we see her as a woman about to get married and coping with doubts. Randolph as Thompson recounts her experiences as a journalist in Germany; she was aware very early on of just how dangerous Hitler could be. Thompson, of course, was a storyteller, and playwright Norman Plotkin has written the play in an engaging narrative style, weaving Thompson’s memories in with her present, impending wedding day activities. Thompson’s real life provided a rich trove of material to the playwright: for example, she met Sigmund Freud a number of times. Thompson reminisces about her love life as well; she was married three times; her second husband was Nobel Prize-winner Sinclair Lewis, who she called Hal. The script includes a wonderful description of Lewis, as well as their passionate but difficult relationship. There’s a marvelous phone call that only lasts a few minutes but gives the audience tremendous insight into their whole marriage, a wonderful piece of writing beautifully performed. Thompson’s life was a fascinating one: She served as a foreign correspondent at a time when there were very few women in the international press corps, beginning in the 1920s. She interviewed Hitler in 1931 and wrote about the consequences if he came to power. In 1934, the Third Reich ordered her expulsion. She wrote a syndicated column read by millions and worked as a radio news commentator. 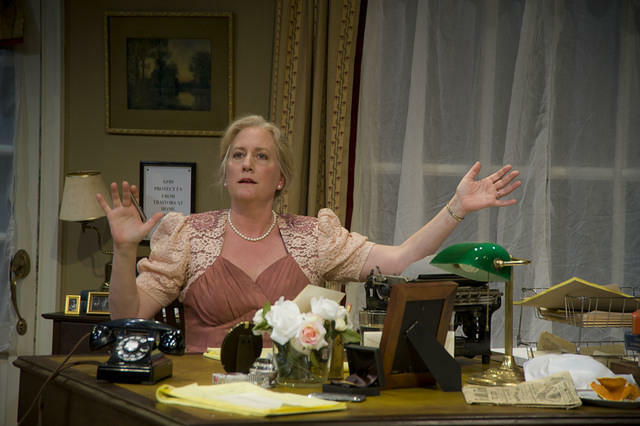 This production of Cassandra Speaks does a marvelous job of reacquainting us with Thompson’s significant accomplishments, and Randolph does an exemplary job of portraying this iconic American journalist. Run time is approximately 90 minutes; no intermission. 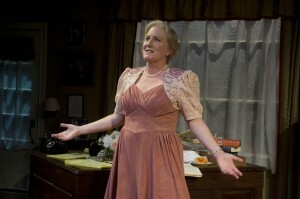 Set design by Patrick Brennan; costume design by Kara D. Midlam; lighting design by Stephen Ball; sound design by Michael Pfeiffer; stage manager is Joan H. Cappello. Shakespeare & Company is at 70 Kemble St. in Lenox, Mass. For more information, visit http://www.shakespeare.org/. 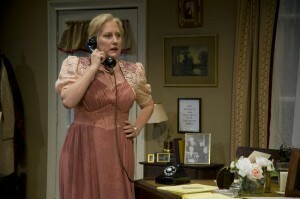 For tickets, call the box office at 413.637.3353. This entry was posted in Theater, Uncategorized. Bookmark the permalink.